NYFW. Wore this outfit to the Rebecca Minkoff s/s 13 show and even though I probably didn’t pick the best day to rock a leather skirt (hello heat wave!) I still love the way this look turned out. All of the pieces (except shoes, sunglasses + jewellery) are Rebecca Minkoff ss13! This entry was posted in Outfit and tagged carvela, celine sunglasses, Rebecca Minkoff, ss13 by Carolina Engman. Bookmark the permalink. That is just wrong… you look way too good girl! Hi Carolina hope you’re having a good time in NYC. You look splendid! Amazing outfit! Love this skirt! Fabulous! Its too much OMG I love this ever so much! Absolutely stunning look! Especially adore the purse. Work it girl loving your style! NYC looks like it would be so much fun! Even though one may not believe in the saying “beauty is pain” I think its still worth it to have in your arsenal. Just as an excuse to wear hot (no pun intended) out fits like that. Well done. LOVE this outfit. The little bag is so cute! i want to see more photos of the FWNY! :D! I adore that skirt! It’s beautiful! the clutch and this shirt make together an ideal set. When I’ve looked closer, I’ve noticed this great necklace – I own similar, although I don’t like artificial jewelry very much – this piece is great! Useful in so many sets! the bag is a dream! Leather and heatwave is no good combi but I think the outfit looks great anyway! I loved Rebekka Minkoffs SS13 collection. It absolutely gorgeous! Gorgeous set! I adore Rebecca’s projects! this look is great and even though I can imagine how warm the skirt must have been, it was so worth it! the blouse looks super interesting by the way! I adore this look & the little bag is super cute! we are so much in love with that top! gorgeous outfit! Enjoy on the fashion week ! You look beautiful, love Rebecca Minkoff! amazing outfit yet again! I love the colors of the top! You looked wonderful! Great shirt! And I love that little bag. Lucky you for getting to wear this in advance ! Love the blouse and bag. I think this skirt is simply aodrable. Lookiing for one already! Looks like you had fun in NYC! Amazing outfit! Great look! Love your outfit.Hope you’re having fun! love the shirt so so much! Ciao Carolina,you look wonderful! Looooove Rebecca Minkoff…..! The bag i so cute! Wow you look amazing, love the shirt! I love the skirt, it look so great! Love your dress! Its great to see bloggers not just wearing graphic jumpers and denim shorts. Although thats a good combo, I think I’ve already seen a little too much this nyfw. Your look is fresh! You look absolutely beautiful… – wonderful outfit and great photos..
funny how this look works for you… amazing!!! awww this collection was gorgeous don´t you think?! Really smart and sophisticated look to show your love of Rebecca Minkoff! 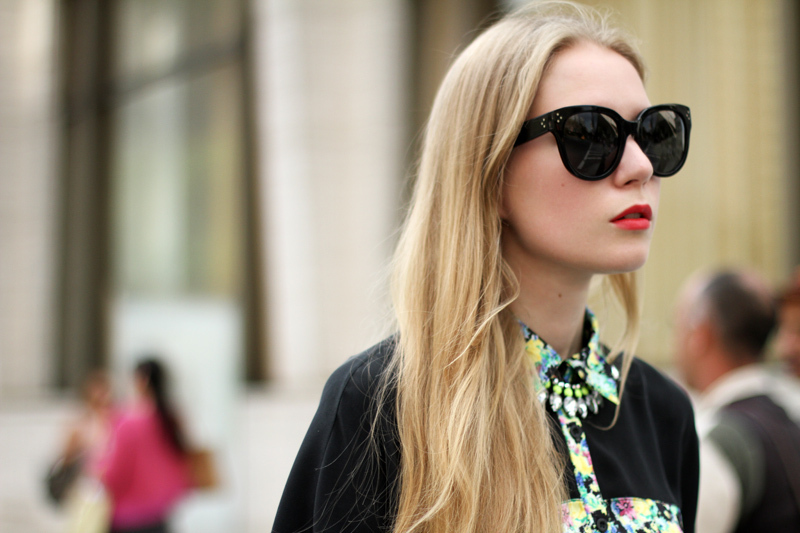 Love the look especially the printed blouse. love this little cute clutch! Wow I am speechless after seeing this!! You are looking gorgeous!! Love the outfit!! Check out what the world’s most famous bloggers are wearing this NYFW! Stunning look! Love the shirt! I love this look. I’m really loving the leather skirt. I really love this outfit and every single bit of it. love this outfit. so nice!! !